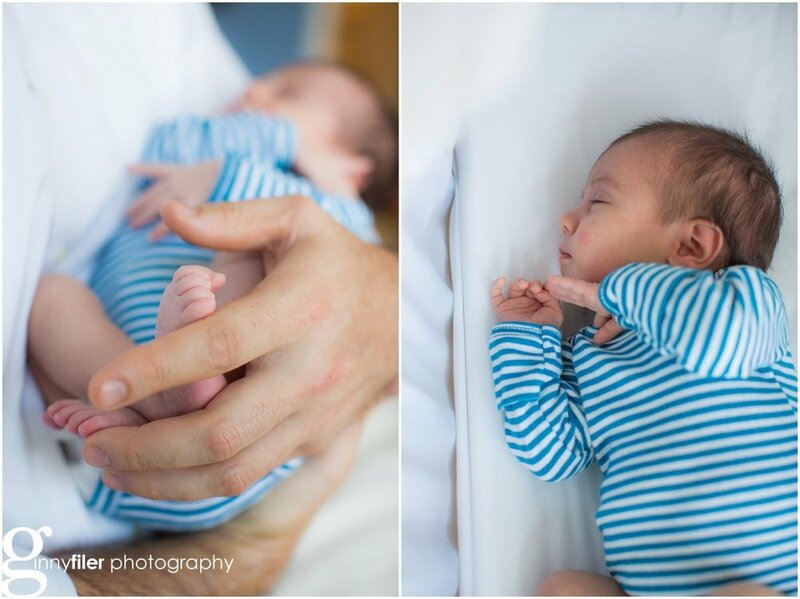 Did you know there are 2 types of newborn shoots? Those sleepy, naked newborn shots with blankets and hats are incredibly sweet and adorable. They make look easy, but as you read here, they require a lot of time and patience! Sometimes it’s not possible to get a session in that 2 week sweet spot for the naked newborns, or maybe there’s just waaaaaay too much going on after your little one arrives and a photo session is overwhelming! Take heart, there is another option: the lifestyle newborn session. This can be done at any age- ideally 0-3 months (a much larger window!). Since the baby is older, they are more awake to see those pretty eyes, and have developed more into “themselves” - you have a few more clues into their little personality and some of their features and expressions are more developed. The photos are more documentary style and show the baby and you together. Sometimes the baby falls asleep so we get some awake and asleep photos- just not completely naked and posed! It’s much more natural and laid back without the pressure of getting them into a sound sleep to pose! These are still done at your home using natural light, so it’s a comfortable and safe environment with all of baby’s needs nearby! The bedroom often works as a great place to get photos of the baby and the family together. I personally find these sessions a bit more unique and interesting! While those sleepy newborn photos are adorable, these bring out the personality of the baby and your family. It’s also an excuse to try all those cute outfits that you've collected from friends and family that are usually too big when they are first born! Reach out if you have questions on either type of session and I’m happy to answer!